No, this isn't the ginger growing in my garden, but it is from the same source. Patchworks Farm was selling some of their first crop of Pennsylvania-grown ginger today! I had to pick up at least one stalk...or rhizome....not sure how to identify my purchase. 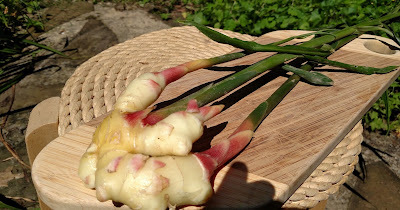 But it did come with the more familiar ginger rhizome root, plus the stalks and leaves. One of the women working the stand told me that while the leaves are best as a garnish she likes to run the fibrous stalks through her juicer - something I never considered. It almost looks too beautiful to cut up. The plant in my hands just seems so different from regular ginger. The base is bone-white, the tips a flushed pink color, and the stalks give off a spicy aroma whenever you brush them. I think I'll use this in Ma Po tofu, using the root in the sauce and the leaves as a garnish. I love the idea of full utilization of the plant, so I may have to see if I can reassemble the juicer Carla found at a garage sale a few years ago.